Ok, I know that decluttering might not, at first glance, fall into the going green or saving money categories, which are the two primary focuses of this blog (along with “being happy”). But if you think about it for just a sec, it really does cover all three. First, decluttering is green because the less you have, the smaller space you need to store it. And the less resources you have to use to heat, cool and maintain that extra space. Decluttering also saves you money because you can sell all that stuff you don’t need. And the less you have, the less likely you are to spend money on more “stuff” to fill that space back up again. It also makes you happy; when you have only things you use and love, you have more room to breathe. The things you own don’t own you. I live a fairly minamalist lifestyle because having too many things just stresses me out. But I haven’t gotten myself down to that perfect level yet; I feel as if I still have too much “stuff”. This is why I so admire Tammy over at RowdyKittens. She pared down her personal items so that she has fewer than 100 “things”. Personal items are things that she (and not her household) use like clothing, books, shoes, trinkets, etc. It does not include things like cooking pans, artwork, or furniture. Can you imagine having fewer than 100 things? Well, I still can’t at this point, even though I’m trying to. I’ve been trimming and trimming, but have been stuck the past few weeks, unable to determine what else I could get rid of. I knew there was more that could go, but I just didn’t know what. How was I ever going to get down to 100 things at this rate? And then Sunday morning, I had the supreme EUREKA! moment. I discovered an awesomely effective way to get rid of clutter. It was one of those wonderfully lazy Sunday mornings. I was at my laptop, coffee in hand, dreaming of spending a month in a Paris studio apartment this winter (hey, I can dream!). 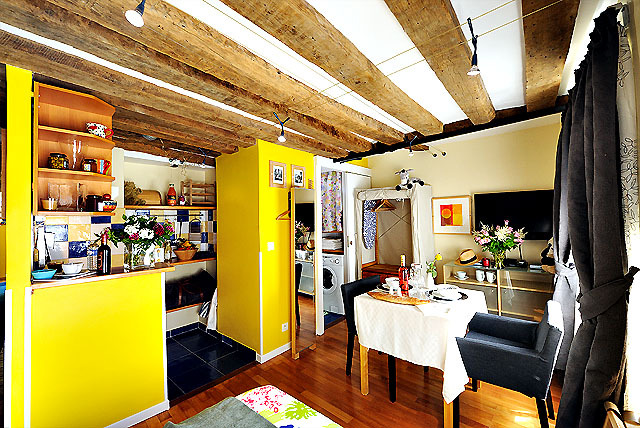 I’d found an awesome site full of apartment rentals in Montematre I could actually afford (800 euro per month! ), and I was browsing through them with sheer delight. Isn’t this lovely? Can’t you just imagine being able to live in a little studio like this for a month (or three)? Well, I sure could. A tiny place like this has everything I would need to be completely comfortable. As I was browsing through all these tiny, colorful, perfect apartments, I felt myself growing a bit envious. These places had everything you needed, and nothing you didn’t. Each space was designed to take advantage of every square inch of space. Living in a space like this meant you’d have a super-small carbon footprint, and you wouldn’t be able to just go out and “buy” something without getting rid of something else in its place. In a place this small, every item would have to be useful or supremely special. I started looking around my own house. My stuff would never fit into one of those funky little studio apartments. Ever. My stuff would never fit into one of those funky studio apartments. 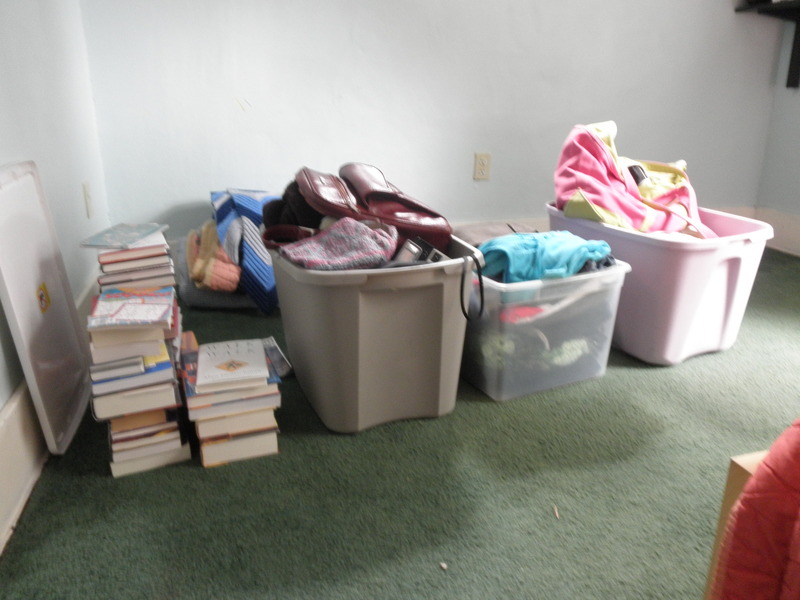 I started to get really excited because I realized this was how I was going to get unstuck in my decluttering. I would go through the house, pretending I really WAS about to move to a small studio apartment in Paris. It’s a dream of mine to do this, so the process was really exciting to think about. The deciding question would be this: would I take this with me, or get rid of it? Did I love this thing enough to cart it across the Atlantic to Paris? Did I love it enough to pay the airport transport, and then haul it up 5 flights of stairs to my dream apartment? Most of the time, that answer was “no”! And into the donation bin it went. God it was a lot of fun. I could have kept going; the only reason I stopped was because I got tired. You can easily play this game in your own life. Do you dream of travelling somewhere to live for a few months? Do you dream of moving? It doesn’t have to be Paris of course; it could be anywhere. Any situation that would cause you to have to pack up and move. You can also declutter effectively by asking yourself this question: if my home was destroyed by fire (or flood, or whatever), would I miss this item? Would I even notice if it was gone? 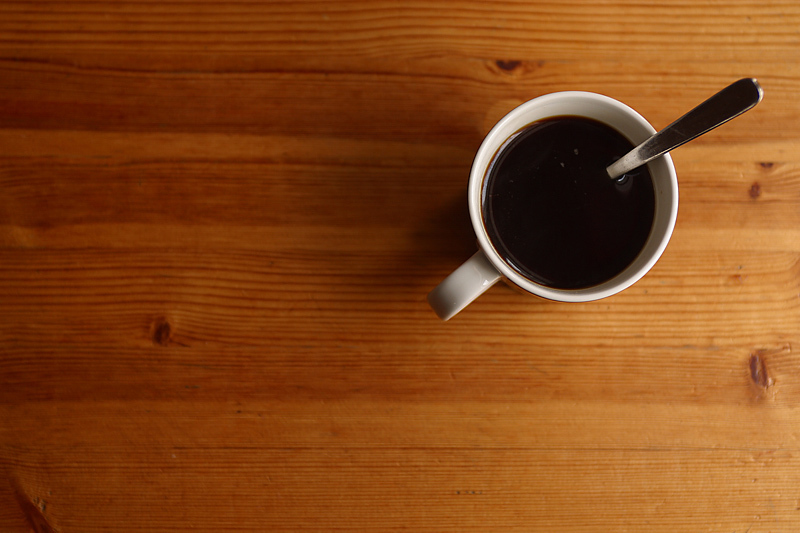 You might be surprised at how often you’ll answer “no” to that question. Like I said earlier, I’ve never had so much fun decluttering. And I’m planning on using this method again tonight to get rid of even more stuff. I hope, if you’re in the process of decluttering (or if you’re thinking about it) you give this method a shot. I couldn’t believe what a difference it made! How about you? Do you have any tips or strategies you use to get rid of stuff? I’d love to hear them! I love this idea (and I love those Paris apartments)! I started decluttering last year and also thought I had gotten rid of everything I could. I was so wrong. I’ve gone through all of my things again the last couple of weeks and have a huge pile for Goodwill/Craigslist/Freecycle. I am definitely going to use the Paris studio method to continue paring down my stuff. Otherwise, I don’t have a very scientific method. It was easy at first and became harder. Now, it’s getting easy again as I realize how much stuff I still have that I haven’t even used or worn since I started uncluttering. @Allison- I know! Decluttering really does take months (or even years). And you reach that point, just like you said, when you think you can’t get rid of even more. But you always can. I’m always decluttering. When it comes to my closet, if it wasn’t worn in the past year/season, it goes (unless it’s a special occasion dress/outfit I know I’ll wear to the next wedding, business dinner, etc.). I always have a thrift store/Goodwill bag in the works. I find that I actually seem to have more to wear when my clothes closet isn’t too full. I can mix and match more easily when there’s not too much stuff in the way. As for the house, I cannot wait to downsize from a 4-bedroom, 1-acre lot in the suburbs to a nice condo in the city, BUT my kids are still at home. Oldest is off to college this weekend (hope I live through it!) and the youngest is still in high school. But I often think, if we were downsizing today, would this make the cut? If not, into the donation box it goes. (Although I will confess to having a vase problem, but I try to purge, really!) 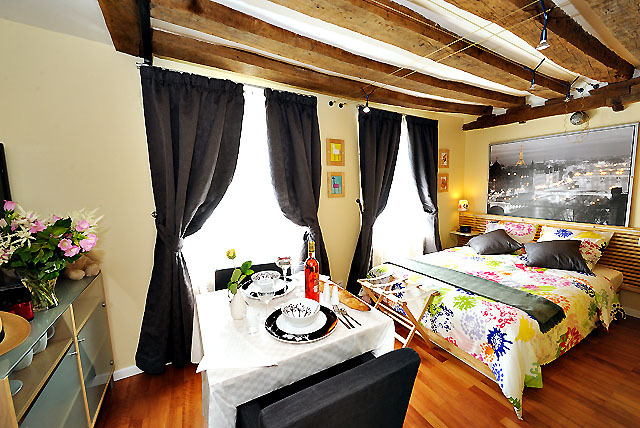 Maybe now I’ll picture that adorable apartment in Paris instead of a generic city-condo! Hey, Just found your site (from a link) and loved this post. I have nothing to offer in suggestions but like yourself, I have a goal to live (in Japan) for one month each year as I’m studying a degree in Japanese Language and Asian Culture. I kinda also plan to maybe live in different towns and states upon my return each year so I have to get rid of enough stuff to put in storage. I konw that it’s not true 100 item decluttering but not everyone is comfortable with that. Yeah I still want some of my furniture and my books 🙂 I put on a few kilos after my divorce (too much home made nachos and Scotch and Diet Coke comfort!) so I’m going through my old clothes and getting rid of stuff and will have just enough to wear when I get back down to my normal weight. Not a dream, it’s happening now. I LOVE the idea of having just enough to live with. I have consumed and purchased so much cr*p over the years, got rid of it after the divorce and then bought some more! Well, not anymore. Your Paris photos are gorgeous and if you can make that dream of yours happen, how wonderful for you! the hardest part for me has been getting rid of my books: My partner, being the most wonderful person on the face of the planet gave me a gift to ease my mind- an Amazon Kindle- A portable, ever changing book! the prospect of getting rid of all my books? not so bad now! Even though most of them are not offered yet on Kindle, they will- and I have a good list so some day, i’ll be able to get them back, without the space constraints!!! Best of luck with your ever-shrinking pile of stuff! I stumbled upon this at just the right time — I’ve been in a holding pattern with my decluttering and simplifying, but the wonderful thought of a gorgeous little Parisian loft overlooking the Seine is just what I need to get back to purging. Thanks! I’ve been decluttering and have reached a stalemate. I’m going to make it a game. Thanks for the inspiration. 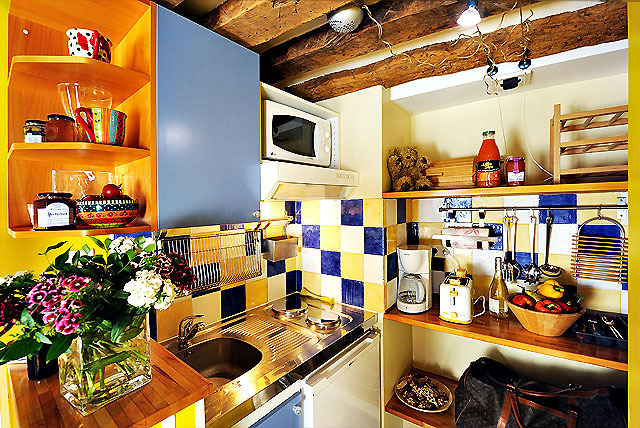 Oh my goodness that apartment is CUTE! I currently live in a 650 sq. ft home and I feel overwelmed by my ‘stuff’. I’m going to try to close off a couple of rooms and create a “practice” studio for a couple of years and then build a tiny, tiny house. One point in my favor is that I don’t actually like shopping and I love organizing! That itch to cut back can last a remarkably long time. In her old age, Mother Theresa was down to owning clothing for two days, and wondered if that was still too much. However, it can also be less wasteful to keep around tools for DIY, and scraps from old projects, than to have to buy new.